Regarding the concept of quadratic rank transmutation, a new distribution with convex combinations of the life distributions of two-component systems (series and parallel systems) whose component lifetimes are not identical is obtained. This proposed distribution has extra parameters compared to the known transmuted distribution. It can also be represented by two different baseline distributions. So, it is very flexible in modeling. A description of the various structural properties of the subject distribution along with its reliability behavior is provided. Finally, a real data analysis is performed for this distribution and it is found that this class is more flexible. Abd El Hady, N. E., Exponentiated Transmuted Weibull Distribution, International Journal of Mathematical, Computational, Statistical, Natural and Physical Engineering, 8(6) (2014). 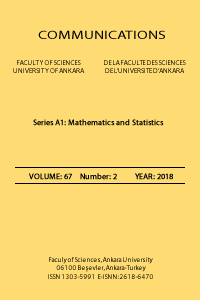 Acik Kemaloglu, S., and Yilmaz, M., Transmuted two-parameter lindley distribution, Communications in Statistics-Theory and Methods, (2017) (just-accepted). Akinsete, A., Famoye, F., and Lee, C., The beta-Pareto distribution, Statistics, 42(6), (2008), 547-563. Al-Mutairi, D. K., Ghitany, M. E., and Kundu, D., Inferences on stress-strength reliability from Lindley distributions, Communications in Statistics-Theory and Methods, 42(8), (2013), 1443-1463. Aryal, G. R., Transmuted log-logistic distribution. Journal of Statistics Applications and Probability, 2(1), (2013), 11-20. Aryal, G. R., and Tsokos, C. P., On the transmuted extreme value distribution with application. Nonlinear Analysis: Theory, Methods and Applications, 71(12), (2009), e1401-e1407. Aryal, G. R., and Tsokos, C. P., Transmuted Weibull distribution: A generalization of the Weibull probability distribution, European Journal of Pure and Applied Mathematics, 4(2), (2011), 89-102. Ashour, S. K., and Eltehiwy, M. A., Transmuted exponentiated Lomax distribution, Aust J Basic Appl Sci, 7(7), (2013), 658-667. Bourguignon, M., Silva, R. B., Zea, L. M., and Cordeiro, G. M., The Kumaraswamy Pareto distribution, Journal of Statistical Theory and Applications, 12(2), (2013), 129-144. Elbatal, I., and Aryal, G., On the Transmuted AdditiveWeibull Distribution, Austrian Journal of Statistics, 42(2), (2016), 117-132. Elbatal, I., Asha, G., and Raja, V., Transmuted exponentiated Fréchet distribution: properties and applications, J. Stat. Appl. Prob, 3, (2014), 379-394. Eltehiwy, M., and Ashour, S., Transmuted exponentiated modified Weibull distribution, International Journal of Basic and Applied Sciences, 2(3), (2013), 258-269. Hussian, M. A., Transmuted exponentiated gamma distribution: A generalization of the exponentiated gamma probability distribution. Applied Mathematical Sciences, 8(27), (2014), 1297-1310. Lee, E. T., and Wang, J., Statistical Methods for Survival Data Analysis, Vol. 476. John Wiley and Sons, 2003. Merovci, F., Transmuted Lindley Distribution. Int. J. Open Problems Compt. Math., (2013a), 63-72. Merovci, F., Transmuted exponentiated exponential distribution, Mathematical Sciences and Applications E-Notes, (2013b), 1(2). Merovci, F., Transmuted rayleigh distribution, Austrian Journal of Statistics, 42(1), (2016), 21-31. Merovci, F., and Elbatal, I., Transmuted Lindley-geometric distribution and its applications, arXiv preprint arXiv:1309.3774, 2013. Merovci, F., and Puka, L., Transmuted Pareto distribution, ProbStat Forum, (2014), 1-11. Rényi, A., On measures of entropy and information. In Proceedings of the fourth Berkeley symposium on mathematical statistics and probability, Vol. 1, (1961), 547-561. Shaw, W. T., and Buckley, I. R., The alchemy of probability distributions: Beyond gram-charlier and cornish-fisher expansions, and skew-normal or kurtotic-normal distributions, Submitted, Feb, 7, (2007), 64. Shaw, W. T., and Buckley, I. R., The alchemy of probability distributions: beyond Gram-Charlier expansions, and a skew-kurtotic-normal distribution from a rank transmutation map, arXiv preprint arXiv:0901.0434, 2009. Singh, S. K., Singh, U., and Sharma, V. K., Estimation on System Reliability in Generalized Lindley Stress-Strength Model, J. Stat. Appl. Prob, 3, (2014), 61-75. Yilmaz, M., Hameldarbandi, M., and Kemaloglu, S. A., Exponential-modified discrete Lindley distribution, SpringerPlus 5(1), (2016), 1660. Communications Faculty of Sciences University of Ankara Series A1 Mathematics and Statistics.